Every celebratory gathering in my grandparents’ home included singing. The song to end the party was always – ‘When you come to the end of a perfect day‘. You can listen to Judith Durham’s version here. I thought of this song this morning and it brought back lovely memories of growing up. But I also wondered, what makes a perfect day? 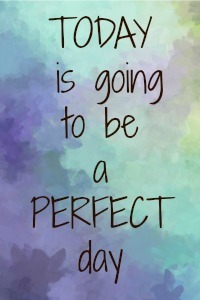 Like everything else, a perfect day would mean different things to different people. To some it might mean a day when things didn’t go according to plan and life surprised them. To others it might mean a day when everything went according to plan! I’ve been talking about consciously slowing down, but I’m aware that not everyone has the luxury of doing that. Also some people are happy being busy – it seems to suit their personality. I am in awe of many women who have very busy working schedules and yet manage to be there for their children and pack a lot other activities too into their lives. My sister-in-law, a doctor, is one such woman. I’ve often wondered how Ann does it – have a full day at the hospital, oversee the children’s homework and make sure they’re on time for their music lessons, try out new recipes, lead a small choir and be part of a choral group and entertain seemingly effortlessly. She leads a busy life and I began to think what makes a perfect day for her. I’m certain hers would be a perfectly busy day when everything went according to plan. But plans don’t always work out, do they? I’ve often heard her taking calls at night giving instructions about patients. There are other times when she gets stuck late at work and the children need some assistance with their homework or schedules. What would make the life of a busy modern woman a little easier? An easy-to-use, mobile app that helps her get more easily organized? Today, Vanaia, a New York-based mobile app developer, has released a video that pays tribute to modern women like Ann. Incidentally, the app, called ScanWritr, is truly worth checking out. It helps you keep your paper work under control with its ability to let you scan, fax, convert to PDF, print, store and share. Couldn’t watch the video, will have to come back for that. But yes, we all would want our days to be perfect 🙂 And to each, her own !! If every day was perfect then there would be no ‘special’ days. A response may be — “every day should be perfect.” I believe this would only work in a perfect world and I’m too much of a realist to think that could exist. To me, a perfect day will be the day my son comes home and it would not matter what else happened that day — it would be perfect and a very special day. A perfect day – hmmm, guess more than the surroundings and happening, it is more in the person. A person who knows how to live happy, probably every day might turn out to be a perfect or near perfect day, which one with cribs won’t find a single day good enough- far from being perfect….A good post with analysis. N just have to say I hugely admire women like your sister, packing life with so much and giving it their best! But the key question your post raises – what makes the end of a perfect day – is worth some real pondering. Thanks for giving me this question today! I love that last line the best. Why can’t every ordinary day be perfect? I think it comes down to us, after all, right? Thanks for sharing this, Corinne. Wow, Corinne! There seems to be an app for everything these days! But I’m all for it if it makes our lives more streamlined or organized. Thanks for sharing! That was a nice video, but sadly, my first thought was, “Why didn’t the older daughter get more attention? And if she wasn’t necessary to the plot, why include her?” Bad habits of a writer’s mind. A perfect day for me is giggling children, completed projects, delicious food, and long conversations before bed. I am one of those busy people, and I use my phone to take pictures for reference later. That’d be a good app for those people who haven’t started that type of organization yet. I could see where that app would be beneficial for someone who has a lot on her or his plate. I have to check this out definitely my kid days are over but now I have my mother her app my appt. Just constantly busy but I seem to do better like that when I have a day of nothing I just seem to flounder all day! I feel it’s such a privilege to draw breath every day, just that fact makes each day perfect.